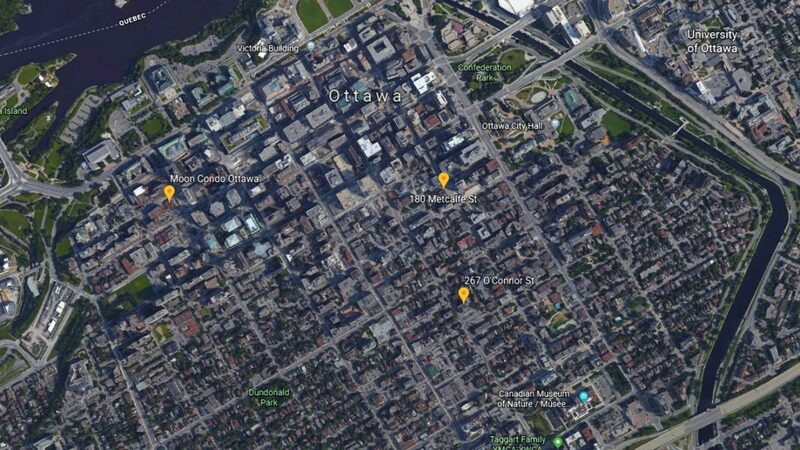 For the last decade, Centretown has been the condo hub in Ottawa. Some of the most popular condos in Ottawa, such as The Mondrian, TriBeCa, Hideaway, Gotham and Cathedral Hill call Centretown home. However, in the last few years, condo development has predominantly shifted into Old Ottawa East, New Edinburgh, and Westboro. There is only one new condo building built in the last 3 year, which is set to open this year. Thank you, SoBa! So, what exactly happened to the ever-growing skyline of Centertown? First, we have to go back 12 years ago to 2007. This was the start of the condo boom in Centretown when you could buy a unit in the Mondrian pre-construction for under $200,000! With pricing like that the condo market started to take shape. Every developer was starting to build and frantically looking for more land. Coming into 2009, everyone in the market was making money. Seller’s were naming their price and getting great ROI, Buyers were jockeying for position to get into these brand-new condos, and developers were in helicopters trying to find the next big plot of land. Then, 2011 hit…. Hard… Mike Tyson right hook, hard! The market absorbed all the condos it could at rising prices and then it stopped. That wasn’t good news for all those buyers in the last few years living in dreamland thinking how fast the market was growing and not thinking, “Hey, is this market real or is it going to crash?”. Compounding problems, developers were scheduled to build phases of towers i.e. TriBeCa East and TriBeCa West with a shrinking condo market. Until roughly 2017, most people in the condo market were trying to recover, wait for pricing to get back to what they paid for and then some, while developers were pushing to get rid of 100’s of condos. Fast forward to today. Pricing has mostly recovered and developers have sold out the majority of their inventory. Great news, right?… Not really. Now that the market is getting interesting again, there aren’t any new project’s coming on the market. Don’t be worried, the team at OC has done some digging and we’ve found 3 projects that should be coming on the market soon! Ottawa’s biggest developer, Claridge Homes, has brought you some of the most popular condos in Ottawa, including Claridge Plaza Phase 1, 2, 3 and 4 and TriBeCa West, East and Lofts. 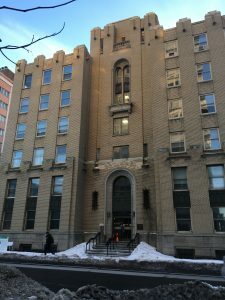 They are currently building a purpose-built rental building on Lisgar (The Onyx) and have several plans for Centretown and the Byward Market. That said, they are going to be the first developer to bring a new project to the market in Centretown. 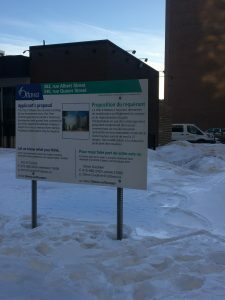 Located on the corner of Albert and Lyon (yes, right next to Ottawa’s saviour, the LRT), Moon Condos is set to be built. The site will contain 3 towers, 2-27 storey towers and 1-9 storey tower. Moon Condos will be one of the 2-27 storey towers, with the other tower being purpose-built rentals. The project is being designed by Neuf Architects and will have ground floor retail space (fingers crossed for a Starbucks) and will feature amenity spaces throughout the building. The unit mix will vary from 422 sq ft studio units to 956 sq ft 2-bedroom units. The project is currently reviewing comments by the community and other stakeholders, but the sales centre is built and we expect sales to start this year. For more details on the project, click here. Arguably Centretown’s most popular condo building, TriBeCa has been a smashing hit with the market. 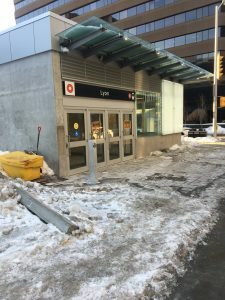 If you want to live downtown there is no more convenient location with a grocery store in the lobby of the building, and steps to Elgin St. What more can you ask for? (A Starbucks? Great idea, just walk to the corner of Elgin and Lisgar and pick up your venti chai latte with extra whip!). Next door to TriBeCa is an art deco style heritage building called the Medical Arts building. It has some of the most amazing architecture but looks worn out. Recently, Jadco bought the building and the massive parking lot in the back is planning something special! They have proposed to keep the existing building, build out the back of the building to have 6 floors of commercial space, likely retail and office, and then construct a 27-story tower of residential. RMA Architects have assisted with the planning and the unit mix varies from 347 sq ft studio’s to 952 sq ft 2-bedroom units. The layouts from the plans to the city look quite promising. A Heritage permit was issued on October 12th, 2018, which means this project will likely go ahead with construction in the next 12-24 months. Unfortunately for all you condo buyers out there, it looks like the building will be designated as a purpose-built rental. Either way, this project is sure to wow all in Centretown. For more details on the project, click here. SoHo isn’t just the name of a famous neighbourhood in New York City. It’s also the brand name of condos that Mastercraft Starwood has brought to Ottawa. The people that brought you SoHo Lisgar, SoHo Parkdale, and SoHo Champagne are looking to replicate their success with a second condo in Centretown. 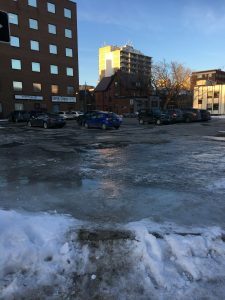 Located on the corner on O’Connor and Gilmour, the site is primed for redevelopment and would give that part of the neighbourhood a much-needed facelift. The project is proposing 2-27 story towers done in 2 phases with ground floor retail and 4 levels of underground parking. One unique feature of this proposed project is the massive flower bed and miniature park that will separate the buildings and act as an oasis in the heart of downtown. IBI Architects are assisting with the designs of the project. No further plans have been submitted regarding unit mixes, but you can assume the same style of all existing SoHo buildings. The application of the project is still pending with the city since August 6th, 2014. With the condo market starting to take shape again, we hope this project gets going soon. For more details on the project, click here. 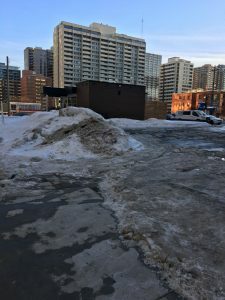 It’s an exciting time in the condo market, prices are starting to climb, developers have an appetite to build again, and it’s never been a better time to live in Centretown. Combine that with the popularity of the Ottawa real estate market nationally and globally, we hope condo developments will start to flourish once again. *This information is believed be accurate, but not guaranteed.